Welcome to Gleaso's Playground's very first blog post! I hope you find my thoughts helpful in your journey to discover your playground. Growing up in Rapid City, SD I spent all my days riding my bike, wandering the open prairie and Ponderosa pine forests. I loved wandering, discovering, being free...I guess today we would say I loved adventure! As I've grown older, it's become easier to lose my sense of adventure, I've become more serious about my career path, rearing children, and getting so caught up in everyday life. Along the way, I forgot one of the most important things in life... ME, MYSELF, and I.
I am proud of my years finding my place in the working world, being a very involved dad, and a loving husband. We all should be. One thing we all need to remember is that your physical being needs to be part of the equation. Through the years, I forgot. I gained a lot of weight. Weighing in at 243 lbs! I had a torn ACL that I had never repaired. With the bad knee and all the added weight, my quality of life was starting to change, as I would discover one day in the attic of my newly built house. In the attic, my knee buckled so I fell part way through the ceiling. Yep. Not good! Time for some changes. We all know that it's easy to say "I need to change" but actually knowing how to change is hard. I liked eating everything in sight and watching endless amounts of television. In addition, it was easy to do as my waistline indicated. What I needed was a plan. I needed to find my thing. I needed a lifestyle change. Eat less, do more cardio. Easy, right? Atkin's - fail, Weight-Watchers - fail, Lifting weights - fail, Run - fail (had to figure with bad knee but I tried), Swimming - fail. I was now a couple years into this with marginal success. I was getting very frustrated. I still needed a plan, a thing to call my own. One day cleaning out the garage I looked up to realize I still had my old college mountain bike. A flood of memories of riding my bike everywhere while I went at college rushed through my head. 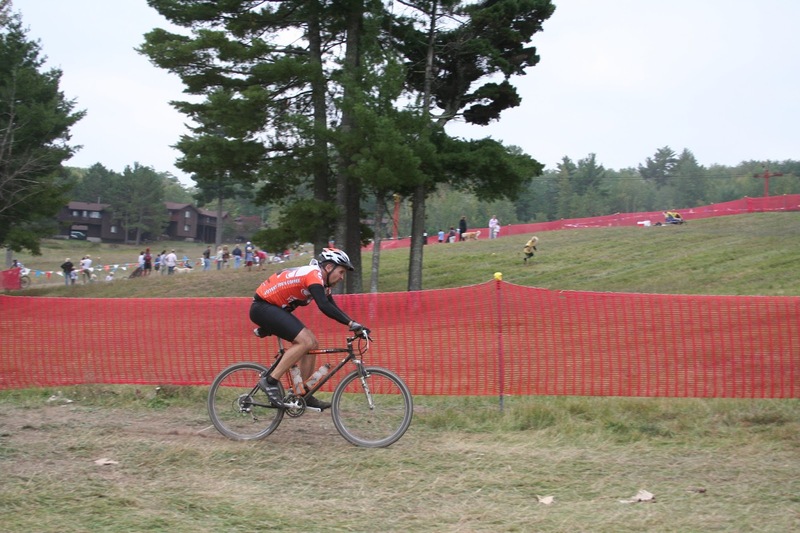 I remembered a race I did in college called the Chequamegon 40, a 40 mile mountain bike race in Hayward, WI. At that instance, I realized my new thing to try. I would train to do the Chequamegon 40! Doing a little research I discovered the Chequamegon 40 was a lottery that filled very quickly every year so I had to send in my application to gain an entry. With app in hand, I filled it out sent it in and waited for my entry post card to arrive in the mail. May rolls around and no post card. I didn't get in. It was a very emotional moment for me because I thought it was going to be my goal, my thing. Fail. This was a setback for me. I actually took a few steps back in my progress. Several months pass, I'm still lifting weights and swimming because I didn't know what else to do with myself. In the spring it was time to try one more time, so sent my entry in but this time I had the luckiest friend I knew at the time kiss the entry envelope with red lipstick for luck. May rolls around again, I checked the bank account to see if the check cleared and it had. A few days later the card came in the mail - I WAS IN!!! Complete panic rushed through my body because I hadn't actual started riding my bike yet. I needed to learn how to mountain bike again and build enough bike endurance to finish a 40 mile race! So the training begins. I started riding “training” late May 2006 with a race date mid-September. I needed to ride enough to finish 40 miles of rolling nasty off road hills. I started riding 2-3 times a week, short rides at first. Slowly increasing the distance and each time I did it was painful my lower back would start hurting 10 mile into the ride, every time. By mid-July I finally could ride 23 miles non-stop so it was time to celebrate. I was pumped. Still a long ways from 40 off road miles but I started to believe I was going to be able to finish. And yes I was not confident I could finish, I was terrified that I might not be able to finish. A couple weeks before the 40 was to begin I finally rode 40 miles for the first time, it was hard but it gave me the confidence I needed to make the drive to the Birkie ski trails in the Chequamegon National forest. Time to do a weigh in to see if this silly goal of mine was working. 225 pounds. Success! Now it’s time to start planning the trip so I started asking others what do you wear in a race like this to stay comfortable. Everyone told me that it depended on the weather. I thought to myself….oh yeah…the weather. Now I’m panicking. I forgot to check the weather. I checked the forecast and you would never guess, yes there was a chance of rain…RAIN! Starting race temperature of 34 degrees. RAIN and almost freezing….WHAT AM I GOING TO DO!!! I’ve never ridden in rain, mud or the cold. 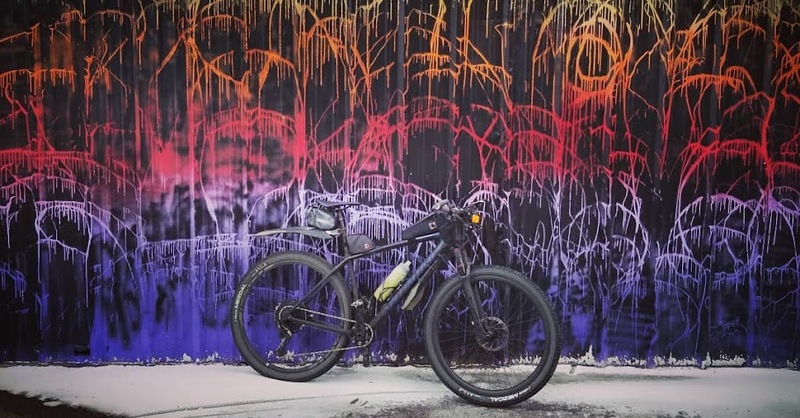 So I called a buddy of mine in Butte, MT that was a year round bike commuter to get some advice on clothing and how to ride in those conditions. He was awesome, he told me what to get and told me to never give up. It was all I needed to hear because I had worked way to hard to give up now. My daughter Sawyer, my son TJ, Me, and Trevor a friend's son. Finally! I get my bike to the starting and I’m ready to go. The rain that I was worried about had cleared and the temp was hanging around 37 degrees so I was feeling a little less freaked out but just a little. Gary the race director started the traditional countdown 10…9….8… to get the race started and then I hear crack the sound of the gun and I was off. I was racing again! It had been years and it felt great, I felt free, relaxed. This was the start of my Adventure! I was 39 weighing in at 225 lbs. I owned a 1998 Schwinn KOM S9 mountain bike. 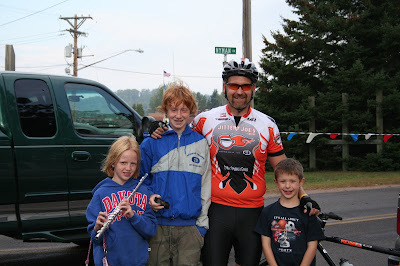 My Chequamegon finishing time was 3 hours 17 minutes and 22.1 seconds. I finished 193rd out of 340 in the 35 to 39 age group and 876th out of 1677 finishers. And when I finished I could hardly walk or talk. I had given that race every ounce of energy I had. My 2006 Chequamegon fat tire festival finish! Great read - for me that story started just two years ago at 39. My goal to be in the best shape of my life at 40 was not realized due to a knee injury training for a 1/2 marathon. At 41 I turned to biking and completed my first road century. This year I turned to gravel and last weekend was my first gravel race at 42 years young. Hearing about your back story is inspirational. I was out a CP1, but now a little wiser - I'll be back in 2016 for a finish, Odin willing. Now on to GW2015 with a home court advantage :) Thanks for sharing. Wow, what a great story. Mine is a bit similar, though I started at 210 and the race that did it was the Triple D. Congratulations on your journey and your success, and I hope to see you out there!